All this talk about Neanderthals and clothing has convinced me that I need to shimmy out onto my limb again. The question is: 'How did the Neanderthals survive the deepest cold of the Pleistocene if, as Gargett maintains, they couldn't have tied their own shoelaces?' My answer--the 'scenario' that I paint in this blurt. It's a work in progress. It's not intended as a definitive argument. It's a starting point--one that, for me, offers a plausible connection between a number of data points that has heretofore been overlooked. What I have to say is a concept in need of serious consideration [even if I do say so myself]. 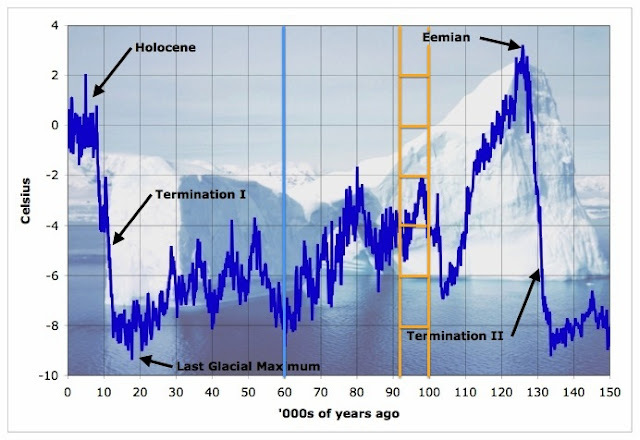 When I'm done I hope you'll be persuaded that a bunch of lines of evidence all come together to comprise a plausible, parsimonious explanation for how the Neanderthals survived the icy cold of the Pleistocene's last glacial stages. I begin by laying out a number of well-warranted premises, which, while seemingly unrelated, allow me to make a couple of hypotheses to explain the phenomenon of an unclothed Neanderthal. Although the whale's living space is never below freezing, it is still deadly cold for most mammals. Whales (and many other marine mammals) survive long periods in cold water because they have evolved to express deep layers of subcutaneous fat. The ability to lay on the fat appears to be a mammalian trait that is differentially distributed, apparently, according to habitat. Premise 2. 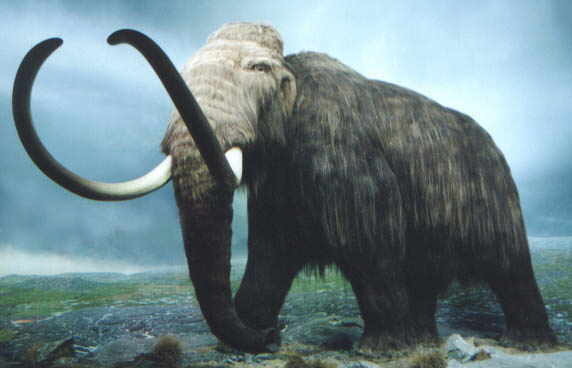 By analogy to whales, fat (and hair) are in all likelihood what enabled wooly mammoths to survive in Pleistocene Europe. Oh, and a hell of a lot of scrubby vegetation. Humans have a propensity to deposit fat when and where possible, and are quite variably hirsute, with ever-growing head hair in most cases. Thus, it is reasonable to assume that our close fossil relations were at least equally well endowed, and there's no reason to think that they couldn't have developed thick enough pelage to keep their skin from freezing. 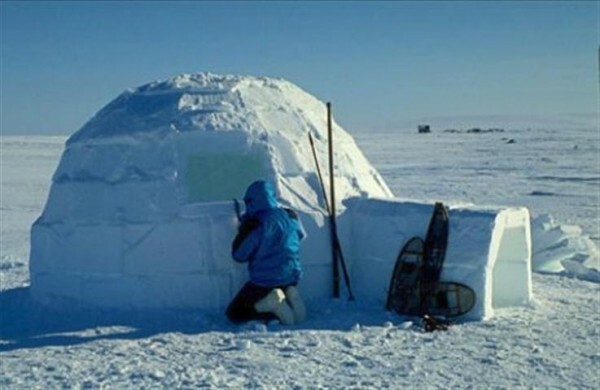 Bergman's rule postulates that a species will develop larger varieties as the climate cools, and the people of the far north, for all their clothing, are volumetrically large and given to putting on fat. 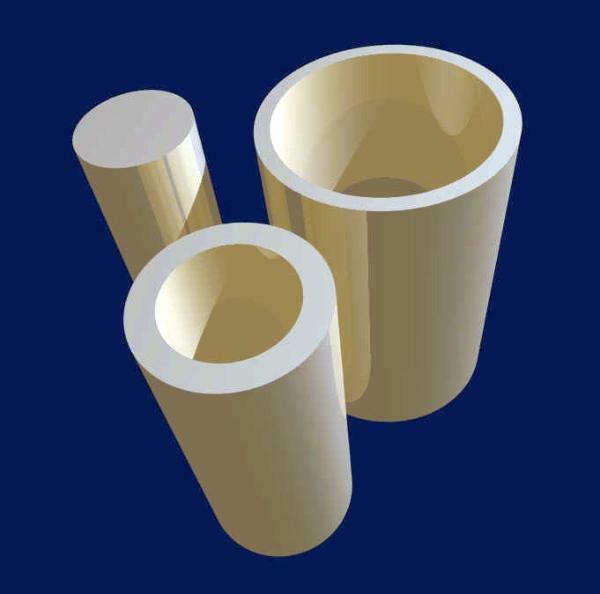 Given two cylinders of more or less the same diameter, the one with the thickest walls will withstand greater forces directed along the long axis. Holding load a constant, weight-bearing surfaces with more surface area will lessen the pressure on any given point, reducing friction and thereby surface attrition, prolonging useful life. Even if the Neanderthals were able to make clothing we'd expect them to be volumetrically larger than contemporary Middle Pleistocene bipedal apes that lived in more temperate regions. Even without the ability to wrap themselves up against the cold, with enough fat and hair, like the wooly mammoth, they might have needed no other protection. I think this hypothesis will be borne out by the discussions below. However, the strong likelihood is that the Neanderthals were far more massive than their skeletally modern contemporaries. Holding location constant we should expect to see volumetrically larger populations when the climate is colder and less volumetrically large populations when the climate is warmer. In other words, it's possible to retrodict the distribution of the Neanderthals in relation to fluctuations in global temperatures during the Pleistocene. On the Late Pleistocene/Holocene oxygen-isotope curve from Vostok below I've superimposed the most likely ages for the Kebara Cave Neanderthals (blue line) and the most likely range for the skeletally modern bipedal apes from Qafzeh Cave (orange 'ladder'). The two sites are approximately 60 km apart and would have been in almost identical climatic circumstances at any time in the past. The modern skeletal form, which had evolved separately in Africa, was inhabiting the extreme southwest of Asia (now Israel) at between 90 ka and 100 ka. The Qafzeh Mousterians were living at a time in the last glacial cycle when temperatures were depressed anywhere from 2° to about 5.5° C. At that time the Neanderthals would have been further to the north, west, and east, hanging out wherever the wooly mammoths hung out during the coldest times. Then, as the final glacial stage set in, and temperatures were depressed by as much as 9° C the Neanderthal niche extended further south. 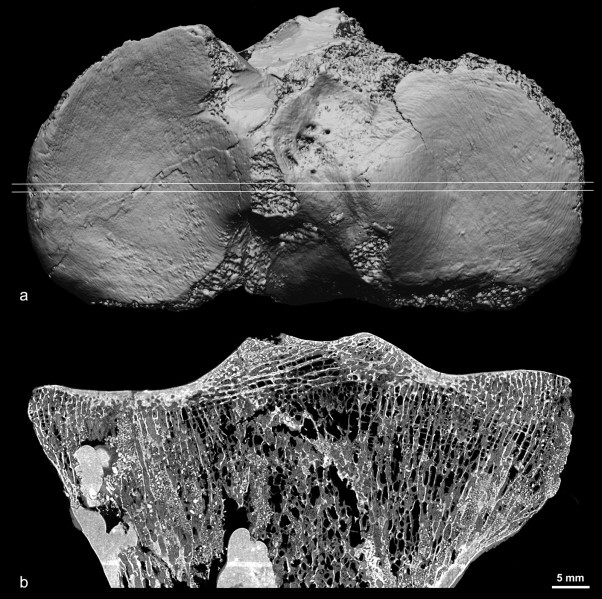 As you can see, the volumetrically larger Kebara Neanderthals were living back in what is today Israel at the climatic nadir of the late glacial period. By that time the skeletally modern form had retreated back into Africa where some time later, in a moment of blazing glory, they miraculously became us. In light of recent genomic studies I think it's necessary to pause for a moment to comment on the question of interbreeding between the Neanderthals and modern humans. I believe it's sensible to postulate that between ca. 100 ka and 60 ka the two populations would have formed a demic 'front,' presumably to the north of Qafzeh Cave, where the two morphospecies would have had the chance to interbreed. This seems to me the most parsimonious explanation for the presence of Neanderthal genes in the modern human genome. And it needn't involve people like you and me having anything to do with those shockingly uncouth Neanderthal people from the wrong side of the tracks. Hypothesis 3. Enough fat and hair to enable the Neanderthals to endure peri-glacial conditions would have been extraordinarily heavy. Thus, you'd expect to see greater weight-bearing capability reflected in the skeleton. 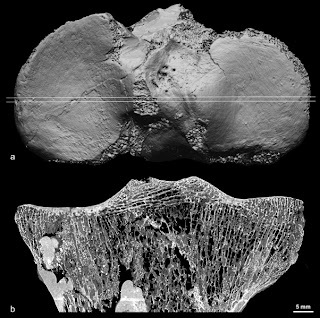 In that vein, if Neanderthals were considerably heavier than modern humans, we should expect to see evidence of it in the weight-bearing parts of the skeleton--i.e. pelvic architecture and size; femoral and tibial diaphyseal architecture and size; synovial surface area of acetabulum, femur, tibia, and tarsals; overall tarsal architecture and size. 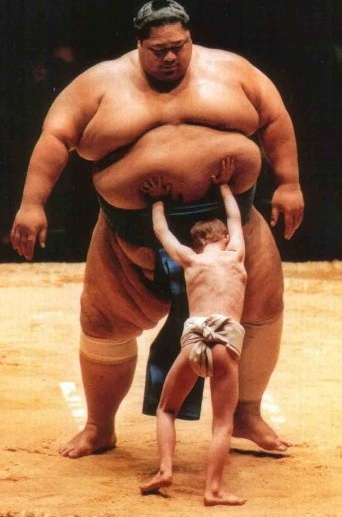 Let's begin with a well-known example of the Neanderthal's weight-bearing capability. It involves simple mechanics, which anyone who's studied osteology will already know. The illustration at left depicts three cylinders that comprise identical amounts of material and are the same length. A force directed along the length of such cylinders creates the circumstances for bending and buckling. Of the three, the bottom cylinder is the one that best withstands bending and buckling. 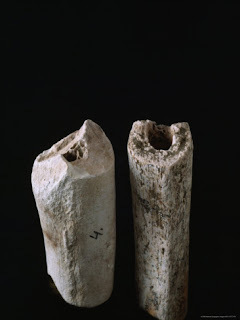 The Neanderthal's femoral cross section, seen below on the left, is a dead ringer for the cartoon cylinder at the bottom, which is capable of withstanding the greater weight. Clearly the Neanderthals could bear much more weight without bending or buckling than the modern skeletal form. It's axiomatic that the Neanderthal condition represents a much more expensive tissue solution for their lower limbs than that evinced by the modern human femur. Why so? I believe the answer lies in an examination of the rest of the load-bearing skeleton. 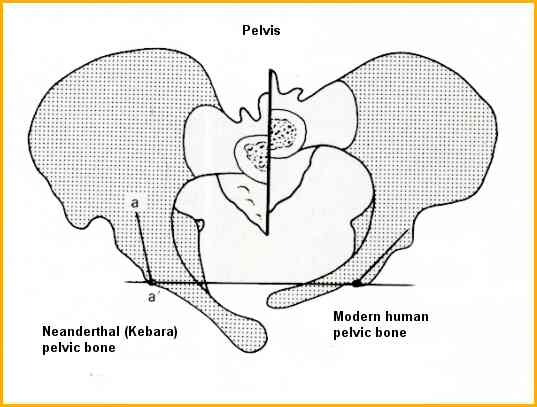 Here you see a comparison, from above, of the size and morphology of the Neanderthal pelvis from Kebara Cave with that of a modern human. The pelvis on the left is longer from front to back. The os pubis is elongated relative to the modern form. Much has been said about the possible implications of this elongation for reproduction. However, an elongated pubis would have accommodated expanded adductor muscles. This would have bolstered the hip joint against the propensity to 'do the splits' by increased upper-body mass. Furthermore, an elongated pubis, combined with a much expanded ilium would have distributed the upper-body mass over a larger area. Taking all these features into account, it's clear that the Neanderthal pelvis would have supported considerably more upper-body mass than the modern human pelvis. Now let's look at the acetabulum and the head of the femur--where, as it were, the rubber hits the road in terms of bearing the mass of the upper body. As you might have guessed, the two structures are significantly larger than those of modern humans. A hip joint with a larger radius would mean a hip joint which could spread the load over over a greater area, allowing the individual to carry much greater upper-body mass. I've already dealt with the femoral shaft. What about the knee? 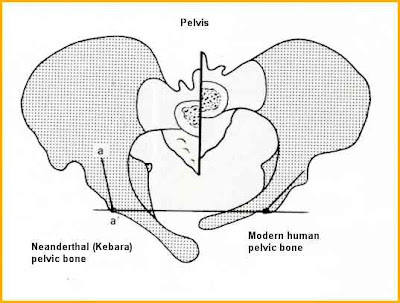 As you can clearly see from the illustration below, the Neanderthal patellar surface is far greater media-laterally relative to the antero-posterior length than the modern human morphology. This would have enabled the Neanderthals to distribute the load more broadly while still maintaining the joint motion required for bipedal locomotion. 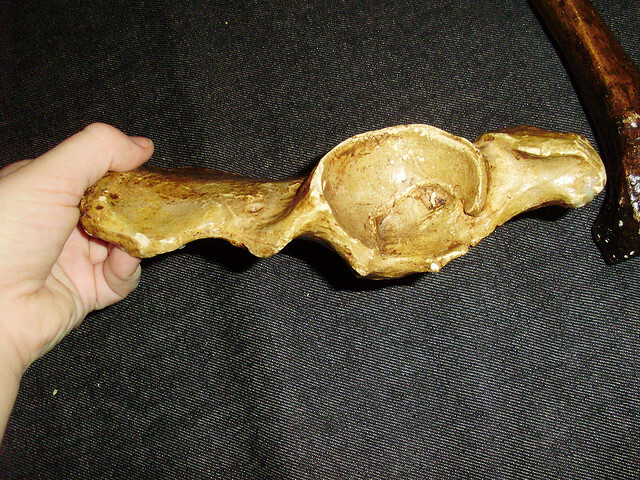 The other end of the tibia articulates with the talus, the most cephalic of the foot bones. Above, the Neanderthal (source); below, modern human (source). 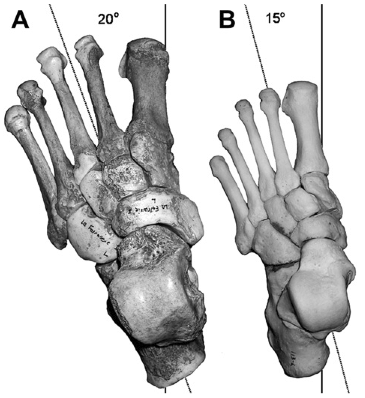 As you can easily see in the illustration below, the Neanderthal foot (on the left) is much larger, and wider, with the metatarsals oriented more laterally than the modern human. Thus, not only is the larger Neanderthal foot capable of handling absolutely greater loads than the modern human, it's footprint also spreads the load relatively more from side to side than that of the modern human, which would mean less pressure overall on the soles of the tootsies. I realize that this is just a sketch of a line of reasoning, and requires much assiduous attention to detail, metrics, and so on. I welcome your suggestions or brickbats, as I attempt to flesh out my thesis. I know that I'd like to possess every measurement of every fragment of the Neanderthal anatomy from the limbo-sacral joint to the baby toe bone. I'd like to know just exactly how much fat it would have taken to insulate a Neanderthal from the cold, and how thick and how long a coat of hair needs to be to keep the skin from freezing. These data can all, I believe, be acquired. I want to know just how much more weight the bottom half of a Neanderthal could have carried. There's a lot to be done. If I could just retire I'd have time to follow through with this line of enquiry AND maintain this blog. As it stands, I can't do both. And I would rather spend nights after work and weekends not doing dishes and laundry to keep the Subversive Archaeologist going than abandon it. 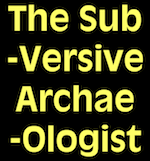 So, regardless of the paucity of 'real' data in what I've presented here, I think you'll agree that mine is as perfectly plausible and parsimonious an explanation of how the Neanderthals survived the Pleistocene as anyone else's. Moreover, my explanation doesn't require that the Neanderthals had anything like modern human cognitive abilities. I believe that this explanation has been right under our noses for some time. However, the universal faith that the Neanderthals adapted to their environment culturally rather than physically has dulled our perceptions to the alternative--that, like any other creature in Earth's history, the Neanderthals were still evolving, primarily, physically in response to their environment. I think we may actually be getting closer to knowing when hominids became human.